TORONTO, ON – July 5, 2018 – The Lexus NX is the compact luxury SUV that’s like no other – a unique expression of style, performance and luxury that reflects what drives you. The NX’s striking style fuses the powerful presence of an SUV with the dynamic agility of a sports car – and seamlessly blends form with function. The boldly-styled Lexus signature spindle grille is flanked by air intakes for enhanced engine and brake cooling, while its gem-inspired headlamps reflect its cutting edge nature. The rear of the vehicle completes the expression of the NX’s low, powerful stance with a roof-mounted spoiler and – on turbo models – a dual exhaust. Inside the NX, the driver and up to four adult passengers are welcomed to a luxurious yet modern cabin. Lexus guests relax in the rich warmth of interior colour schemes – including Rioja Red, Glazed Caramel, and the F SPORT exclusive Circuit Red. Regardless of hue, Lexus Takumi craftsmanship is evident in every stitch. Under the hood, Lexus guests will find a choice of two powerful yet efficient powertrains. For the NX 300h, a 2.5L Atkinson cycle four-cylinder engine forms the heart of the Lexus Hybrid Drive – a self-charging hybrid-electric powertrain that delivers 194 system horsepower and remarkable fuel efficiency through an electronically controlled continuously variable transmission. Regardless of powertrain, all 2019 Lexus NX models feature the added all-weather confidence of all-wheel-drive and highly responsive and efficient electric power steering. All models also feature the Lexus Drive Mode Select system, which allows drivers to fine tune the vehicle to multiple performance and efficiency profiles to match their mood and the road conditions. The NX series also delivers high-performance safety, starting with Lexus Safety System +. This bundle of active safety technologies (pre-collision system with pedestrian detection, lane departure alert with lane keep assist, dynamic radar cruise control, and automatic high beam system) is now standard equipment on 98% of all new models Lexus offers in Canada. Other standard safety features include whiplash injury-lessening headrests on the front seats, LED brake lamps, a backup camera, eight airbags, and a tire pressure monitoring system. All 2019 Lexus NX models are generously equipped with convenience features and amenities. These include Lexus Enform – a multimedia system combining Enform App Suite 2.0 and Enform Safety Connect – which highlights an audio package that also features Lexus Display Audio with USB audio input and Bluetooth connectivity. Other standard features include dual-zone automatic climate control, Smart Key System with Push Button Start, and more. The 2019 Lexus NX 300 with Premium Package (starting MSRP: $48,000) adds a driver’s seat memory system, power tilting/telescoping steering column, and exterior mirrors linked to the memory system. It also features a power back door, aluminum roof rails, 18” alloy wheels, and the power tilt/slide moon roof. Additional amenities include heated and ventilated front seats, an integrated garage door opener, auto-dimming side view mirrors, a compass, and a 120v/100w power outlet – while safety is enhanced with the Blind Spot Monitor and Rear Cross Traffic Alert systems. The 2019 Lexus NX 300 with Luxury Package (starting MSRP: $53,500) builds on this, replacing Scout GPS Link with embedded navigation and other Enform upgrades. The display audio system is enhanced with additional speakers and a 10.3” screen, plus the Lexus Remote Touch interface system. The cabin features leather seating and shimamoku woodgrain trim, while the exterior sports premium triple-beam LED headlamps with the auto levelling headlamp system. Safety is further enhanced with the addition of rain-sensing wipers, clearance and backup sensors, plus the Rear Cross Traffic Braking system. The 2019 Lexus NX 300 with Executive Package (starting MSRP: $56,700) builds on this, adding heated rear seats, a head-up display, the Qi wireless charging system for personal electronics, remote releases for the rear seat located on the dash and in the cargo area, unique 18” alloy wheels, and a kick sensor on the power back door. Safety is enhanced with the Panoramic View Monitor. 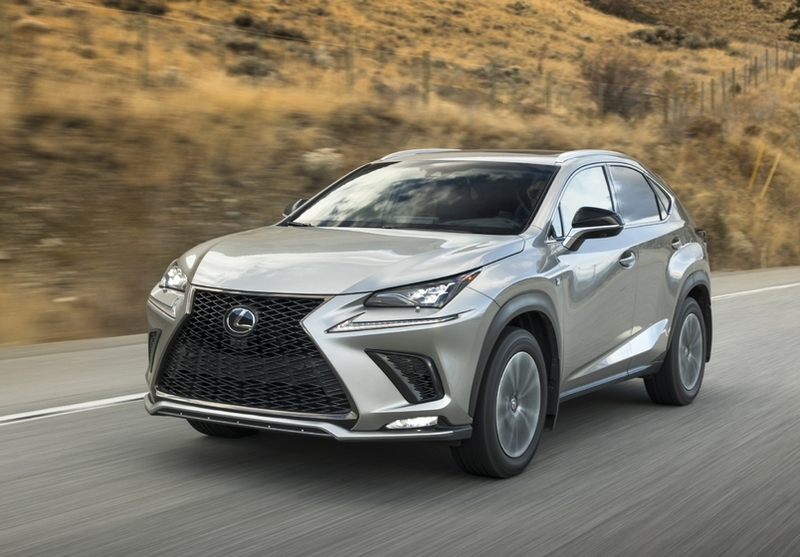 The 2019 Lexus NX 300 F SPORT Series 1 (starting MSRP: $51,350) features a driver’s seat memory system, power tilting/telescoping steering column, and exterior mirrors linked to the memory system. It also features a power back door, aluminum roof rails, and the power tilt/slide moon roof. Additional amenities include heated and ventilated front seats, an integrated garage door opener, auto-dimming side view mirrors, a compass, and a 120v/100w power outlet. This model then receives unique performance enhancements, including a sport-tuned suspension, G Meter, premium triple-beam LED headlamps, and aluminum sport pedals with rubber inserts. Finally, it’s uniquely finished with F SPORT-specific detailing – including its 18” alloy wheels, fog lamps, badges, mesh front grille, shift knob, seats and seat material, and scuff plates. The 2019 Lexus NX 300 F SPORT Series 2 (starting MSRP: $54,400) builds on this, replacing Scout GPS Link with embedded navigation and other Enform upgrades. The display audio system is enhanced with additional speakers and a 10.3” screen, plus the Lexus Remote Touch interface system. Safety is further enhanced with the addition of rain-sensing wipers, clearance and backup sensors, plus the Blind Spot Monitor, Rear Cross Traffic Alert and Rear Cross Traffic Braking systems. The 2019 Lexus NX 300 F SPORT Series 3 (starting MSRP: $57,200) builds on this, adding the performance benefits of front and rear adaptive variable suspension systems, plus a head-up display, the Qi wireless charging system for personal electronics, and the Panoramic View Monitor. The 2019 Lexus NX 300h with Premium Package (starting MSRP: $55,900) adds a driver’s seat memory system, power tilting/telescoping steering column, auto-dimming exterior mirrors linked to the memory system, aluminum roof rails, and 18” alloy wheels. Additional amenities include heated and ventilated front seats, an integrated garage door opener, a voice-actived SD-card based navigation system with Lexus Remote Touch interface, and a 120v/100w power outlet – while safety is enhanced with the Blind Spot Monitor and Rear Cross Traffic Alert systems. The 2019 Lexus NX 300h with Executive Package (starting MSRP: $62,800) builds on this, adding premium triple-beam LED headlamps, woodgrain trim, leather seating, heated rear seats, a head-up display, the Qi wireless charging system for personal electronics, , unique 18” alloy wheels, and a kick sensor on the power back door. Safety is enhanced with the Panoramic View Monitor, rain-sensing wipers, an auto-levelling headlamp system and automatic high beam function.